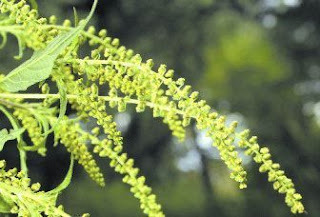 Ragweed season may be among worst in decades "Allergy sufferers, look out: This year's ragweed season is going to be a monster." "All that ragweed pollen could make this one of the worst seasons for allergy sufferers in five decades." "More pollen in the air means more discomfort,"
"Pollen counts -- already high . . . are expected to be off the map Friday and in the months ahead." The article exhorted those with bad allergies to "arm themselves for battle now, before the pollen starts flying." Let the battle begin . . . I'm just hoping that the Hebrew Monster doesn't catch wind of this new development and take unfair advantage while I'm fending off this fierce microscopic foe.